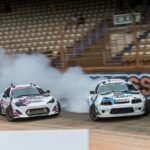 They say that every cloud has a silver lining and in Kiwi drift couple Drew and Jodie Donovan’s case it was a call-up last week for the pair to fly to China to join top local drift team NND for the first two rounds of this year’s China Drift Championship. The invitation came from China-based Moroccan drifter Simon El Alaoui.. Newly married Kiwi drift couple Drew and Jodie Donovan have big plans for their ‘honeymoon year’. Major upgrades to their matching Cryptopia-sponsored Toyota Supras are underway now – and the pair are hard at work on an ambitious schedule which will see them compete here over the 2018/19 D1NZ summer drift season and overseas later next year. While the number..